The word of log splitting is changing at a fast rate. Apparently, kinetic energy seems to be the wave of the future in this field. Rather than using the hydraulic pumps as most wood splitters do, the kinetic log splitters employ a powerful flywheel system to power your wood cutting machine. This fascinating system stores energy produced by the engine in the spinning wheels and releases it in a single burst to pop through the logs at incredibly high speeds. No more waiting for the ram to slowly squeeze its way through the log and after that meticulously withdraws itself. That’s how unusual a kinetic wood splitter can be! They’ve got the shortest full cycle time that goes as low as 2.5 seconds only! Have you checked at the cycle time indicated in your hydraulic splitter? What’s the rate? It probably lies somewhere in the 15-to 30-secs range. These seconds will add up when you're splitting a cord after the other. With the kinetic log ﻿﻿splitter, however, you can expect a cycle time of 2.5-3 seconds, including auto-withdraw. This means that the kinetic splitters are around six times faster compared to the hydraulic models. Whenever you go looking for a new wood splitter at the stores, the first thing you’ll look for in every machine is the tonnage. That makes sense; in the hydraulic splitters, it is the most ideal approach to determining their energy or wood splitting capabilities. It is not possible to measure kinetic log splitters in terms of tons. This stems from the fact that the force they output comes in a single, speedy thrust, as opposed to the continued push in hydraulic machines. To make it easy for you to understand the splitting capacity of a particular kinetic driven machine. Therefore, most vendors will give you the hydraulic tonnage that a given kinetic wood splitter would out split. For instance, a given kinetic splitter (say splitter X) can out split a 34-ton hydraulic. You might have heard that a hydraulic driven log splitter is easy to maintain. But a kinetically driven log splitter is easier to manage. Keep in mind that the hydraulic oil and pumps are eliminated in this model. This explains why they’re much easier to maintain No messy oil, no flawed valves. The only maintenance service a kinetic wood splitter will need from you is an occasional engine tune-up. This is much like any other machinery out there. What’s more- the electrically-powered kinetic wood splitters don’t even need that! Kinetic log splitters can deal with all types of logs that the hydraulic models handle. From the knotty ones, hard ones, and so on. They have the ability to effortlessly get through the most challenging logs at a pace that you just will have a hard time believing! Usually, electric log splitters are an impressive approach to enjoying the capacity to break apart wood indoors – say in your barn or shed. They also offer you the convenience of not dealing with messy gas and oil. Electric powered hydraulic splitters are generally accessible at low tonnages only (3-ton, 5-ton, and so forth). This is perfect for splitting small logs as well as kindling.But what of the electric powered kinetic wood splitters? They’re simple the big guys in this field. The market has come up with such models which are incredibly powerful and will out split a 22-ton hydraulic splitter! Undoubtedly, that’s a lot of splitting power, all produced by pure electricity! While applying the kinetic technology to log splitting might be a new idea, the framework itself has been around for a very long time. The modern designs have been adopted from the mill machinery that was used in US's industrial age– sturdy steel machines designed to last and last! A hydraulic splitter’s splitting force (in tonnages) ranges from 8-3 tons while that of a kinetic model translates to 34-ton in the hydraulic splitter. A hydraulic model can come with either gas or electric powered engine, and so does the kinetic model. The cycle time for hydraulic splitter is 13-20plus seconds compared to the three seconds per split in kinetic splitters. The number of cords produced per hour is 0.25 for a hydraulic machine and 1 for the kinetic machine. While a hydraulic machine is capable of splitting around 216 pieces of wood in an hour, a kinetic model will break 864 in the same duration. Which between the two machines ranks higher regarding performance and results? If you run a test between the two machines suing the same type of wood, operation, duration as well as conditions, you’ll get to know which machines is better than the other. You’ll find out that a kinetic wood splitter will be stronger and faster at splitting the wood than the hydraulic model. What's more, it will just consume a little amount of gasoline/electricity, making it energy efficient. 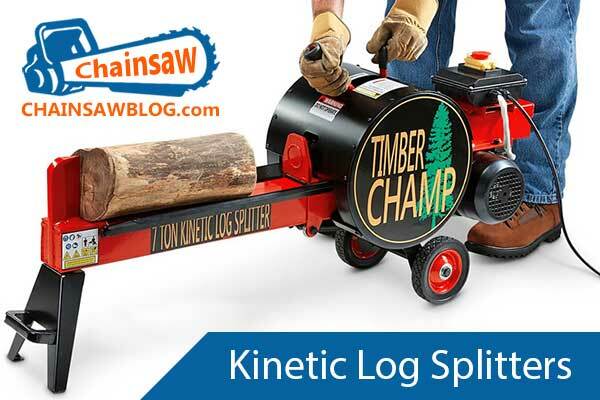 After reading this post, you’ll get a clear picture of what kinetic log splitters are, their splitting power, how they work, how to use them, and other features. It’s also clear that the kinetically driven machines are far much better than their hydraulic counterparts regarding performance. They’ll get your job done quickly and effortlessly.